The new evangelisation is brought about not just by priests but by all the baptised the President of the Pontifical Council for the Promotion of the New Evangelisation has said. Archbishop Rino Fisichella said this fact should be recognised in a concrete way by the Church. 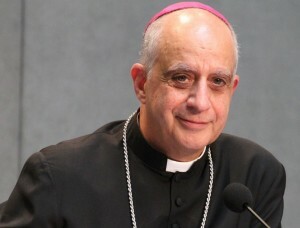 Answering a question on the clustering of parishes in Ireland and the future shortage of priests, Archbishop Fisichella told CatholicIreland.net that it was not just in Ireland that this process was taking place. But he believed there was a great participation of people and young people in the Irish Church and this gave him hope. Referring to the international meeting on the New Evangelisation which took place this week in the Vatican, drawing together 2,000 people from 60 countries, he noted there was a good number of people from the UK and Ireland. If we had no women, he said, we should have to close all our parishes because they are the ones who are most present in catechesis and helping. Lay people are already present and working in the new evangelisation. “Then there is such a richness of global movements with a new style of life. The Church is often not aware of them but they are present. How can we give concrete, official recognition for that?” he asked. Earlier Archbishop Fisichella met twenty-four bishops from the Congo who were making their ad limina visit to meet the Pope. In the Congo, said Archbishop Fisichella, there were just 500 priests and 80,000 catechists. Archbishop Fisichella was addressing journalists in Rome on the topic, “A deeper look into the Magisterium of Pope Francis”.